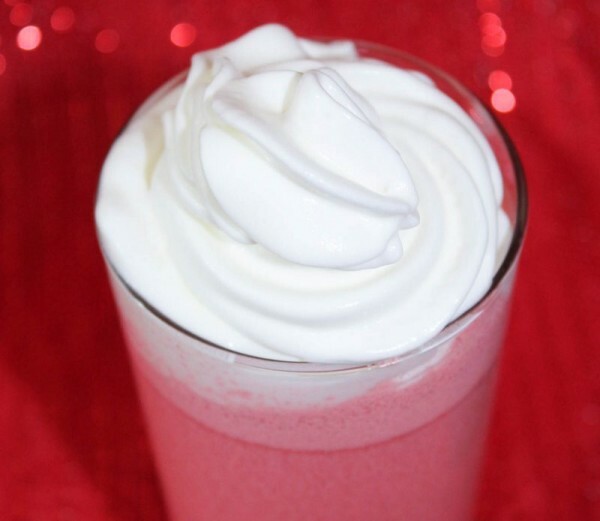 French Vanilla Raspberry Italian Cream Soda: Perfect for Valentine’s Day! 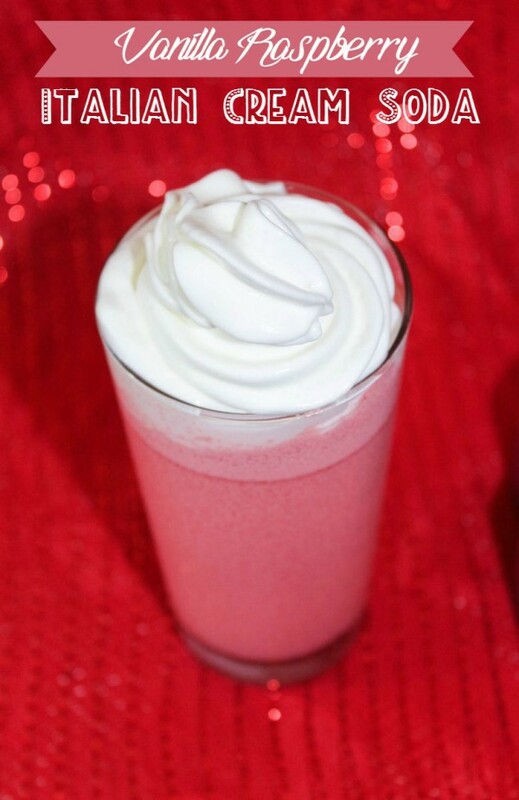 Need a quick, easy yet pretty Valentine’s Day beverage that’s perfect for kids and adults alike? My French Vanilla Raspberry Italian Cream Soda takes less than a minute to make per serving, yet it’s so pretty! I am actually really proud of this recipe because I figured it out all by myself. A long time ago, I had this great Italian Cream Soda at a coffee shop. Ever since then, I’ve been asking for it at different places. They always have fancy “Italian sodas” on the menu, but when I get it, it turns out that they’re just some sort of lemon-lime soda with a splash of flavoring. That’s NOT what I had in mind! My mom bought me a bunch of Torani syrups for Christmas, big bottles of French Vanilla, Hazelnut, Caramel, Raspberry and Peppermint. While most of them are going in my coffee, I thought “I wonder if I can figure out how to make Italian cream soda with them?” So I started tossing stuff into a cup. It actually came out good on my first try, but I tweaked it a bit (and used measuring utensils for the recipe’s sake) to what you see below. 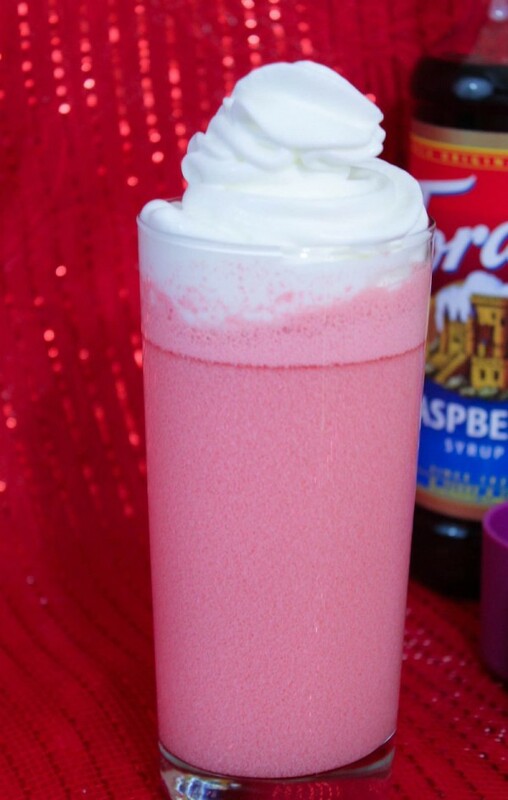 This French Vanilla Raspberry Italian Cream soda is pretty awesome, if I do say so myself! I’m not sure if it’s the way that very first shop would have made it, but I’m happy with it! Where it says 1 ounce, I actually used a shot glass, after making sure it was in fact a 1-ounce shot glass. It doesn’t have to be precise. Start with a 16-ounce glass. Start with cold seltzer water. You can add ice if you want, but you’ll need a bigger cup then, since I measured out without ice (I rarely put ice in stuff, sorry). Let the seltzer settle for a few seconds, then add the two flavors, one shot at a time. Watch it swirl, because it’s pretty. Or not, it doesn’t affect the recipe! Add your cream and stir well. Serve with a straw, because you’ll need to stir it periodically if you don’t drink it quickly. The cream will want to part ways with the seltzer. They need a little coaxing to realize they were made for each other. Force those love birds back together with a swirl of the straw! That’s it! Enjoy! You can make so many different types of Italian cream soda by switching up the flavorings. It’s quick, easy, delicious, and just enough pink to stand out on your Valentine’s Day party table! Have you ever had an Italian cream soda? What do you put in yours? What other flavors would you make? That sounds so good! Definitely a fun treat for Valentine’s Day! This sounds so unbelievable and simple! I will definitely have to try this! I have heard of italian soda but have never actually had one. The ingredients seem fairly basic so I may have to whip one up and give it a try. Yep, super basic, super easy! That’s pretty much the only way I can make stuff, lol! That looks absolutely delicious! I have never had an Italian soda I’m going to have to give a try to this maybe on Valentine’s Day. This looks so great! I love raspberry flavor and I’ll have to look for the syrups so I can make my own. This looks incredibly yummy! I need to try this out!! What a fun and unique treat. I would love to have my boys try this out for a sweet treat on Valentine’s Day. It sounds awesome, perfect for parties! I love cream soda and I wouldn’t mind giving this recipe a try! This looks so delicious! I am going to have to make some for me and my sweetie! This looks so yummy! It would be great to make a larger version of this to serve at a valentines day party! Thanks for sharing! Never had Italian cream soda. It does look refreshing and great for a Valentine’s day party. I will look for the ingredients and give it a try. That looks and sounds delicious and I love the colors for Valentine’s Day. I’ll have to try this as it’s piked my interest. Yum! It looks so good and a great idea for Valentine’s Day. Simple and delicious? I’ll take it! Looks so refreshing. Adding this to my list of recipes! Thanks for sharing this sweet treat! Believe it or not I’ve never had a cream soda. Maybe I’ll try making this with my kids. wud totally try this recipe!! i can already smell the deliciousness! Wow that looks very tasty. Thanks for sharing how to make it, I would love to give it a try. That looks soooo yummy! I love cream sodas and I can’t wait to try your recipe. This looks so yummy and so delicious, I can not wait to give it a try. This looks SO YUMMY!!! It’s so pretty too! Perfect for this time of year! That looks so delicious! I absolutely love Torani syrups and now I’m imagining all of the different flavor combos I’d love to try with this. Wow does this ever look good – I’ve been wanting to try Torani syrups, it would be fun to try this for the upcoming holidays!